Add innovation to your team! Are you looking for a person with "spark" and a steady flow of ideas to help provide you with a different perspective on your company's development challenges? 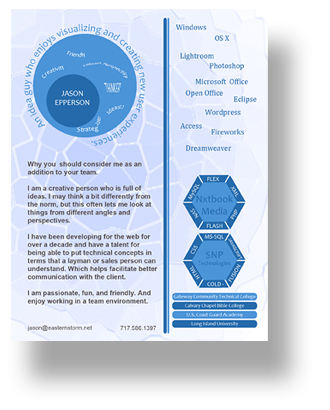 With over a decade of experience in web development I have the necessary skill set to complete complex tasks while retaining an abilty to bring a unqiue and fresh dynamic to an organization. My skills include the ability to describe technical concepts in simple terms in order to facilitate better communication with clients & associates. I am passionate, friendly, and enjoy the dynamics of working in a team environment. If your company is looking for a creative and seasoned developer than search no more.